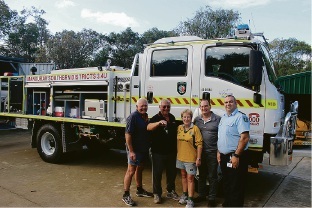 Fire control officer Arthur Stanton, Captain Allan Bennett, |secretary Pam Bennett, First Lt Christopher Mackey and DFES |district officer Terry Wegwermer with the new firefighting truck. THE Southern Districts Bush Fire Brigade is now in a better position to protect life, property and the environment from wildfires after receiving a new firefighting appliance on April 29. The new 4WD appliance has a 3000-litre capacity that will greatly increase the firefighting capability in the southern area of Mandurah. Department of Fire and Emergency Services district officer Terry Wegwermer and City of Mandurah emergency management co-ordinator Myra Giardini facilitated the delivery of the new vehicle, which was later celebrated at the brigade’s annual dinner. City of Mandurah chief executive Mark Newman said the work the City undertook with its emergency service partners was vital to ensuring the community could be protected. “It’s vital that our emergency service personnel are well equipped to manage fires and this new truck is a great asset to the Mandurah Southern Districts Bush Fire Brigade and our community,” he said. The Southern Districts Bush Fire Brigade’s fire vehicles are supported by the Emergency Service Levy. For more information regarding the City’s bushfire management, call 9550 3777 or email council@mandurah.wa.gov.au.